A dangerous amount of toxic waste, 1,000 tons of silver and 300 tons of gold were dumped across the world in 2014 due to inadequate recycling - says a recent United Nations University study. Precious metals are used as components for household appliances and electronic gadgets. Almost 42 million tons of such 'e-waste' were simply thrown away in 2014. The UNU study estimates the potential value of the globally wasted resources at about $50 billion. The volume of gold alone is more than 10 percent of what is mined every year. Most of the electronic waste comes from the US and China. Combined, they amount for about a third of the enormous pile. But if rated by e-waste per capita, European nations are in the lead, with Norwegians throwing away the most - over 28 kilograms per person. The least waste is generated by African countries, at just 1.7 kilograms per person. "Worldwide, e-waste constitutes a valuable 'urban mine' - a large potential reservoir of recyclable materials," UN Under Secretary-General David Malone said. But apart from the valuable metals, growing mountains of e-waste have hazardous components, including 4,400 tons of ozone-depleting toxins and 2.2 million tons of lead compounds. "The hazardous content of e-waste constitutes a 'toxic mine' that must be managed with extreme care," David Malone said. 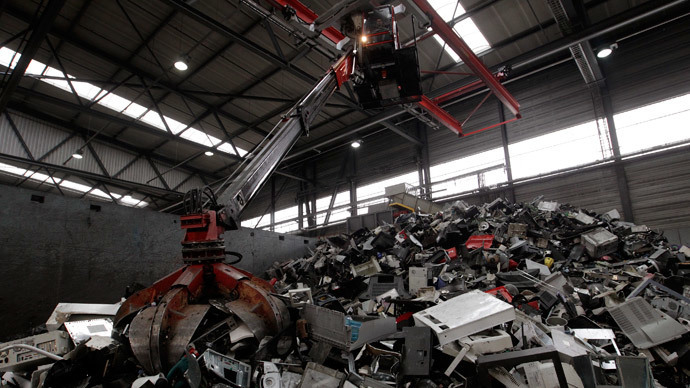 The amount of electronic waste is growing by two tons each year, says the report. The increase is driven by growing sales of gadgets and their decreasing lifecycles. The report says only 16 percent of globally produced e-waste is being properly processed and recycled. The rest ends up in common landfills. A separate study by the British pro-recycling charity Wrap says up to 23 percent of the electronics dumped are in working condition, or only need minimal repair.